At the top of many people’s bucket lists is going on safari in Africa. Planning a safari trip to South Africa can be a daunting experience that is confusing, expensive and time-consuming. In planning our South Africa safari, we were inundated with information, some of which was contradictory or not very clear. There are a number of national parks in South Africa that offer a safari experience, but selecting the right safari option was a real challenge for us. Now, fresh back from our trip to South Africa, we’re sharing our experiences. 1. Which park or nature reserve do you visit? 2. What type of safari will you do? 3. How will you book your South Africa safari experience? 4. How do you arrange the transfers? 5. Which time of year should you go? In South Africa, the granddaddy of the parks is the vast Kruger National Park. This covers a massive 7,500 square miles in the Northeast part of the country. 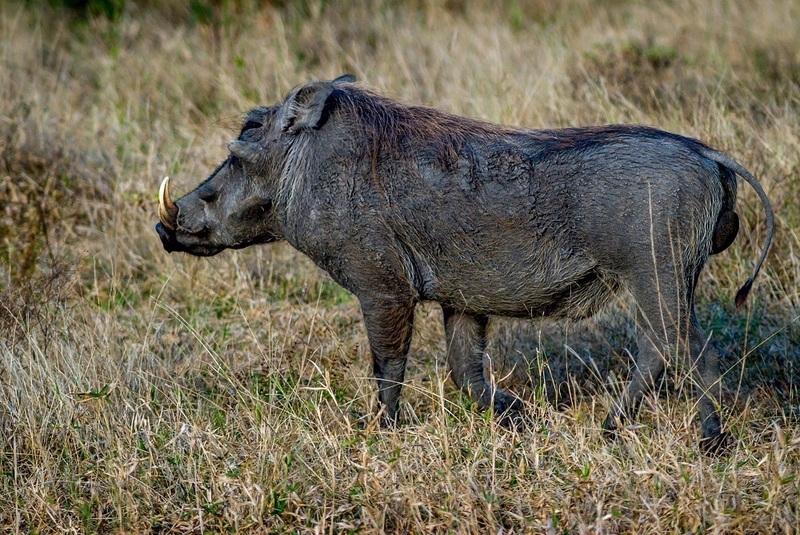 Surrounding the park, but sharing unfenced borders, are a number of small private game reserves. 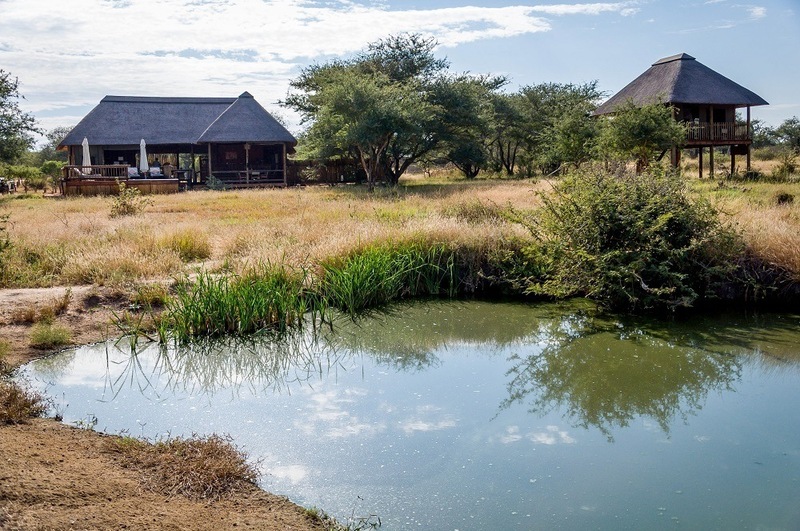 Within the Kruger National Park itself, the lodges and accommodations are generally quite primitive and rustic (there is no luxury accommodation within Kruger itself). 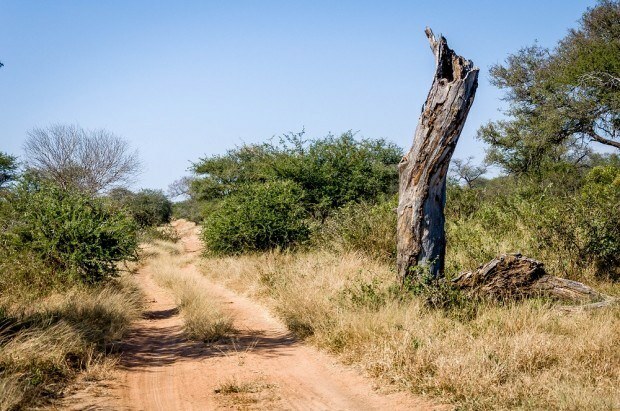 But most importantly within Kruger, you can’t leave roadways or 4WD tracks and follow animals into the bush. This limits game viewing abilities. 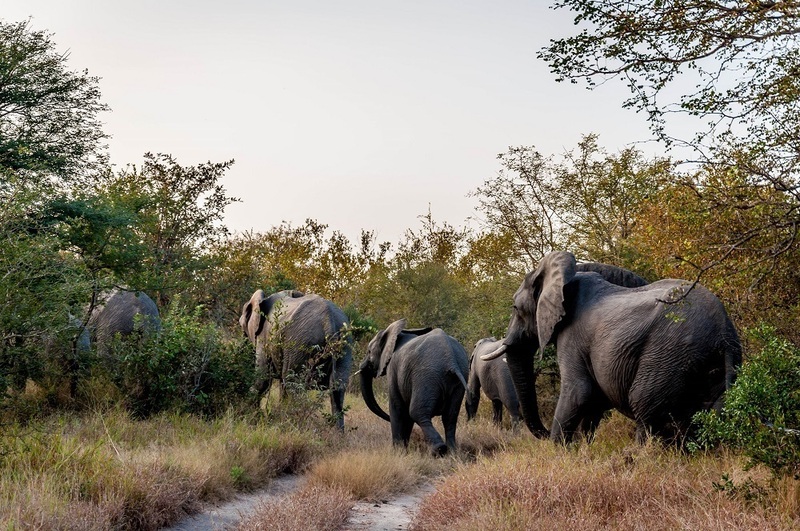 Kruger National Park itself generally attracts European or South Africa holiday-makers who are looking for a self-drive/self-catering experience. Sabi Sands Game Reserve – This is the most well-known of all the private game reserves and Sir Richard Branson has his safari lodge here. Sabi Sands is also the most expensive/luxurious of the private reserves by far. The safari lodges within the Sabi are quite dense with over 19 lodges in 251 square miles. Timbavati Private Nature Reserve – This is one of the largest private reserves in the greater Kruger area, blending remoteness with luxury. Many people are calling this the “new Sabi.” It has 12 lodges and camps in a narrow ribbon, mostly along the western edge of the reserve. 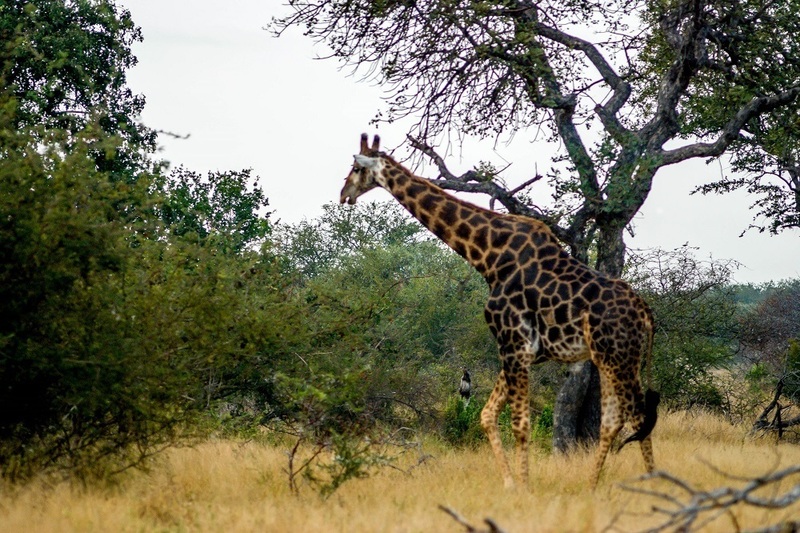 All told, Timbavati encompasses nearly 232 square miles. 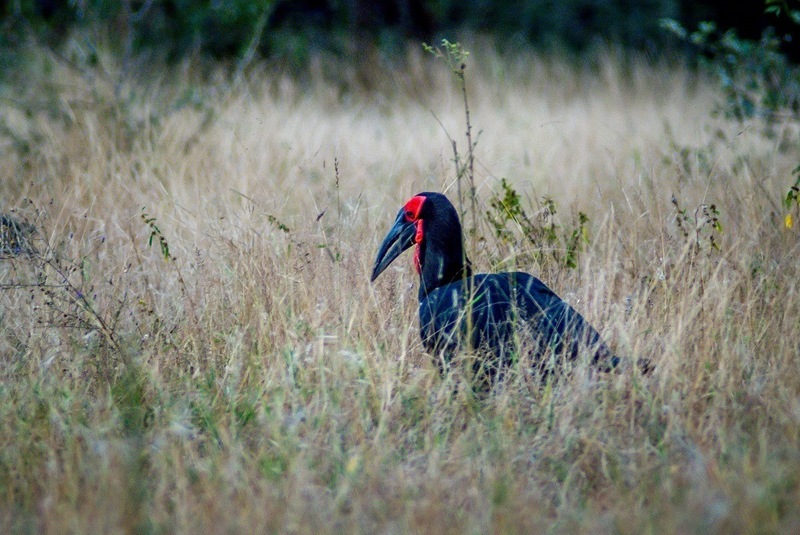 Klaserie Private Nature Reserve – The furthest west of the private reserves in the Greater Kruger. 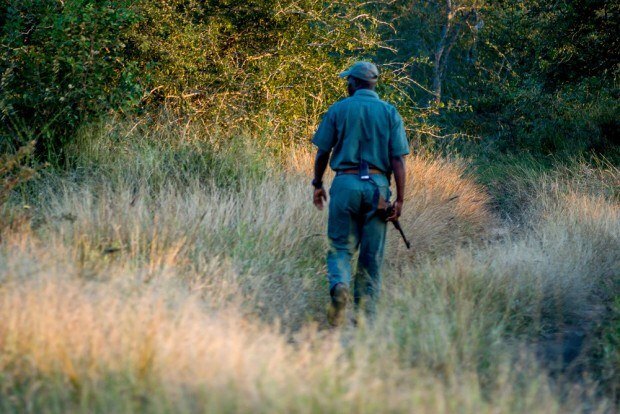 Like other private reserves, the lodges within the Klaserie have the ability to track the game off-road and into the bush. Klaserie is also the least developed of all the private game reserves in the area – there are just 6 game lodges for over 250+ square miles. Each of those lodges or camps is quite small, leading to a more intimate experience. Many of the camps in the Klaserie are completely “off grid”, using solar power instead of unsightly power lines. We stayed at two different safari lodges (nThambo Tree Camp and Africa on Foot) in the Klaserie on our South Africa safari trip. Not all of the lodges or camps in the nature reserves are the same. In a typical lodge experience, you will go out well before sunrise on a game drive and then do a second game drive starting just before sunset. In between your two game drives, you’ll have the chance to read a book, soak in a pool (if you lodge has one) or just relax. However, other lodges focus on walking safaris, which gives a more active experience. At a walking safari camp, you’ll have the chance to do a walk either for sunrise or mid-day to appreciate the bush on a different level. We found that we really enjoyed the mix of the two experiences. When booking a South Africa safari, there are some options. 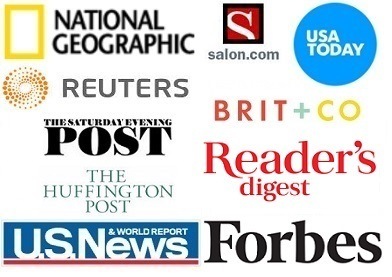 For North Americans, it seems the preferred method is to find a tour operator, travel agent or travel advisor to handle all the arrangements for you. Everyone we’ve ever known who has gone on a South Africa safari has done this approach. Generally, these companies make the selection of the reserve for you and you might have a couple of lodge or camp options. 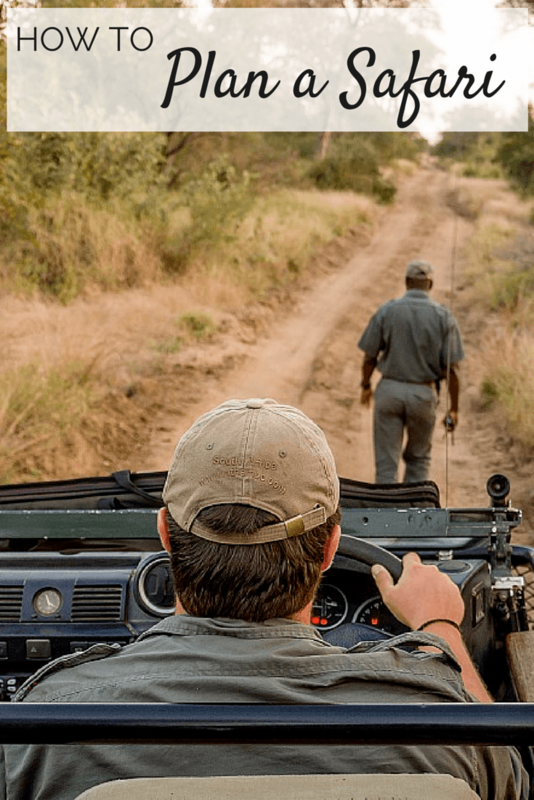 These companies make the experience more accessible for most visitors by demystifying the process, answering questions and booking you into safari camps they have either visited or worked with previously. They will also handle the process of booking your transfers, airport connections and other logistics. Naturally, they will charge you a premium for this service. As we looked into our trip to South Africa, we were initially going to go with a tour operator. We didn’t know the South Africa safari properties and the logistics of getting from Johannesburg or Cape Town to the safari camps seemed daunting. And we didn’t have a lot of time to devote to the research and planning process for this trip. The good news is that South Africa is easier to navigate than most European countries. Signage is all in English (or dual Afrikaans and English). People are extremely friendly. The roads are wide and easy to navigate. And, despite South Africa’s population, the roads near Kruger are completely vacant. In short, renting a car in Johannesburg and driving up to the Greater Kruger National Park (including the private reserves) is a simple process. If you are against driving, there are also a number of transfer companies. 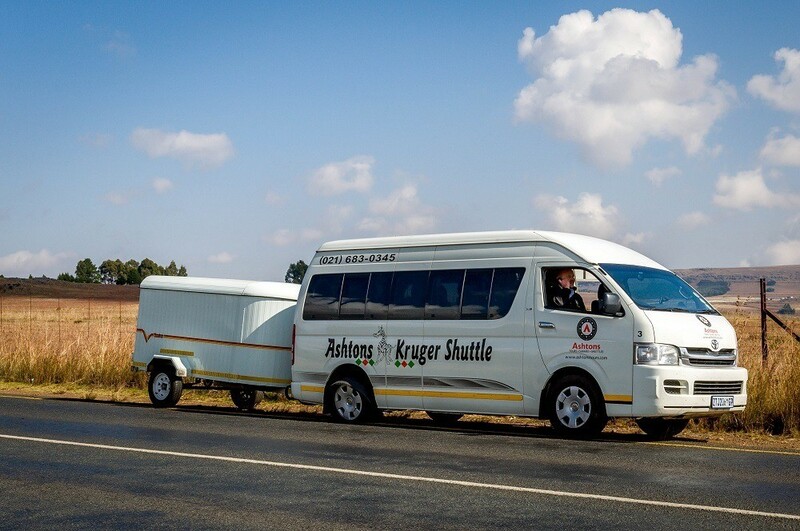 We took Ashton’s Kruger Shuttle right from the Johannesburg airport and it dropped us on the doorstep to the Klaserie Private Nature Reserve, where we met by our local lodge. Ashton’s operates an efficient transfer operation with clean, modern micro-buses and a consistent time schedule. 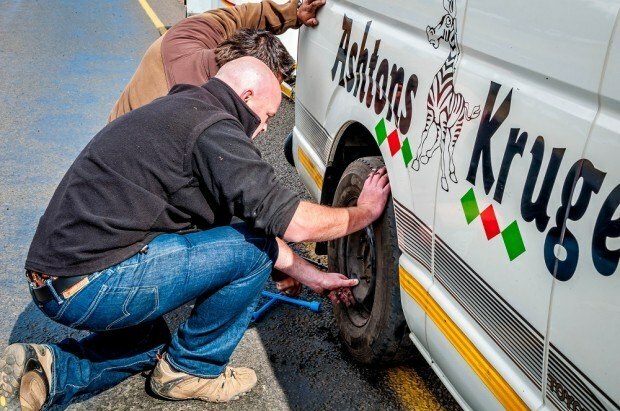 And all went according to plan except a brief unscheduled pit-stop. It seems some workers in one of the local towns we passed through weren’t too happy about something and put glass out in the roadway as a form of protest, popping our right rear tire. We were out in the countryside when it went flat. Our driver Brandon had it fixed very quickly and we were on our way again. However, part of me was grateful for the flat – it gave us a chance to see some of the countryside we would have otherwise blown through. Rather than being an aggravation, we actually thought the workers protest and subsequent tire incident was quite comical. The North American summer (winter in South Africa; May-September) is the best time to go. The days can be cooler and there is less vegetation making it easier to see animals. Since this is the dry season, the animals tend to gather at watering holes. Also, it is easier to get around on your South Africa safari and your jeep is less likely to get stuck in mud. We found late May and early June to be the perfect time for us. A final note – if you are traveling with children, consult with your local lodge on appropriateness. Some lodges, camps and reserves prohibit children under a certain age. Going on a Big Five safari was at the top of our list for our South Africa trip and we could not have been happier with our experience. No matter what decisions you make for your South Africa safari, we promise it will be the trip of a lifetime! We were the guests of Ashton’s, Africa on Foot, and nThambo Tree Camp. As always, all opinions are our own. 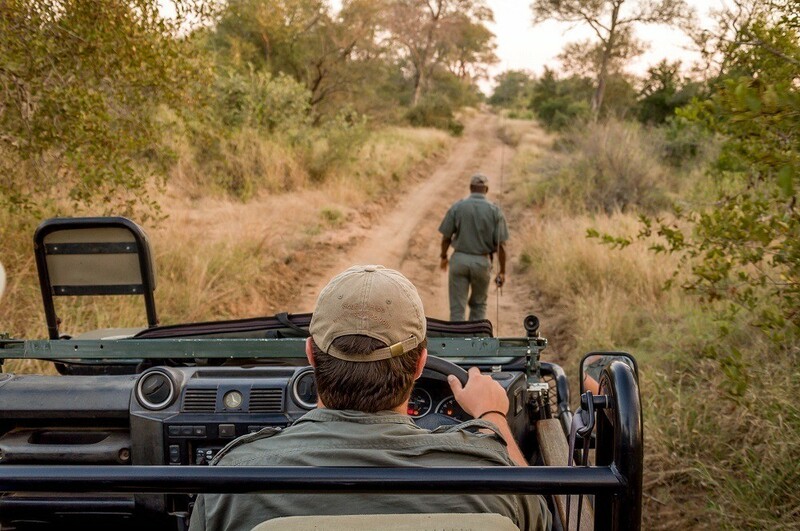 What do you think about How to Plan a South Africa Safari? This was timely as I was just thinking how much I want to do an African safari, although it will have to wait until the kids are a bit older. I am guessing two year olds and safaris don’t mix well! It does just look amazing though. I am so jealous! Two years old probably isn’t so great, but 8 or 10 would probably be fine. It really is an amazing experience. Such a useful post! I hadn’t realised you can’t get as near to the animals in Kruger! The sabi sands sounds very luxurious! I’ve done safari in Tanzania but never in South Africa and will keep these tips in mind if I plan one there! 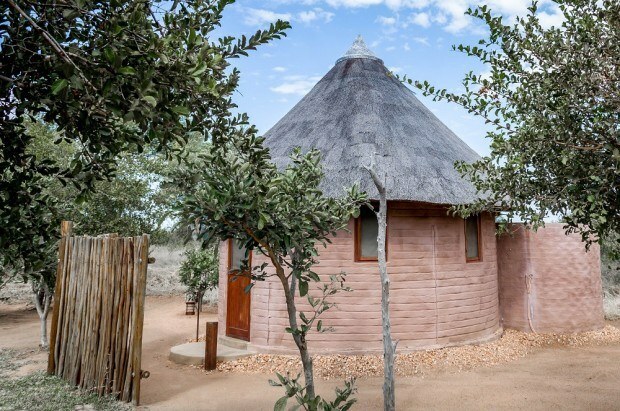 This brings back fond memories of my visit to South Africa years ago – but many of these lodges are new and weren’t around then. I remember those early morning wildlife walks, eyes drooping with fatigue, and the evenings, watching animals come and feed and drink nearly on my doorstep. Some of the most spectacular photographs I have are from game parks in South Africa – Kruger for starters, but also some of the northern parks like Hluhluwe and St Lucia. We went on safari in Tanzania earlier this year and it was so fantastic that we’re itching to do another somewhere else in Africa. It can definitely be overwhelming trying to plan a safari, so this is a great resource to help do that. I worked at a ecological field research center in rural Kenya one summer back in college and it was a truly life changing experience. For one, it inspired my love of world travel! I dream of going back somewhere on the continent one day, taking my husband this time. Thanks for the tips! What a great experience, Cassie! There’s so much to see in Africa, but I think many people (ourselves included) overlook it for lack of knowledge about the different countries. Awesome post! We were just talking about how we need to make an African safari happen ASAP. We were thinking of going in January- I know you said the North American summer is best, but do you think that would still be an okay time to go? Casey I wouldn’t t worry about visiting in summer, in fact as a regular visitor to the Kruger it’s my preferred time of year. The bush is so much more alive in summer, yes it is thicker but you’ll still see plenty of wildlife, I’ve actually had equally good sightings in summer (if not better) as in winter. My only word of caution is the heat, I love it, the hotter the better but that’s not everybody’s cup of tea and it will get up around the 40 degree mark. All the accomodation in kruger has air conditioning and the main camps have swimming pools though so it’s really quite manageable. Very good information with nice photos. We are looking into a Safari for 2016. How far out in advance do you need to book? Also, did you consider other countries like Tanzania or Kenya? What about a multi-country Safari, what are the additional complications that we should be aware of? Thank you. Thanks Dan. We planned our overall trip about 6 months in advance and then specific properties about 2 months in advance. For us, the plan was only South Africa. We didn’t seriously investigate multi-country. The challenge is internal bush flights, very little luggage and sometimes pretty expensive. Good luck with your planning and let us know how you make out! Great article. We are going on a Safari in a few weeks and I am really struggling with what to pack/wear. Any suggestions? How exciting! Our safari was in late May, so the temperatures were probably different than they will be for you. We haven’t written a packing guide for that yet, but what we took is similar to what we packed for the Galapagos/Ecuador: https://traveladdicts.net/2015/07/what-to-pack-for-ecuador-galapagos.html. You probably wouldn’t need the sandals or waterproof gear, but the rest should be pretty close. The key is to dress in layers, as there may be a big difference between day and early morning/night temperatures when you’ll probably be on game drives. 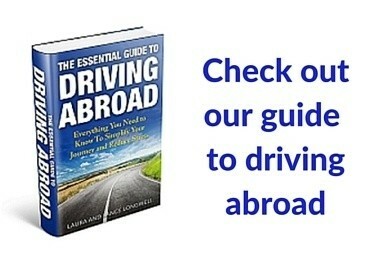 An interesting article, but I must add that most tour operators don’t charge a premium. We get reduced rates from the lodges and other services and the difference between those rates and the rack rates you would pay if you went direct is normally what we charge, but you get the benefit of having all the research work done for you, saving you time. We do spend time finding the right itinerary to suit you and your budget and have the local knowledge, either personally or from our contacts in South Africa, or wherever you’re looking to travel to. Don’t dismiss us as we do offer a valuable service. Thanks Lareine. Travel agents and tourism providers have their place. We’ve used them in our travels, particularly when there is a language barrier or complex logistics. That said, rack rates are a little misleading. Most lodges offer significant discounts for booking directly. The lodges may be able to charge slightly more directly than a tour operator (who may be getting a volume discount), but the consumer pays less than if they went through the tour operator. Tour operators and travel agents do simplify the planning process. If someone is time constrained, that could be a good option for them, but that service does come with a cost. I’d like to hear more details about your lodge experiences. Thanks! We had great experiences at Africa on Foot and Nthambo Tree Camp. You can read about them here. You’re welcome! Let us know if you make it happen. We’d love to hear about your experience.